DCB was registered as a Limited Company on 6th September 2001. In April 2002, DCB started business as a regional microfinance institution. On 12 June 2003 the bank was issued with a license to carry out banking business as Dar es Salaam Community Bank Limited. In 2005, after only 3 years of its operation, DCB broke-even. In 2008, DCB became the first bank in Tanzania to be listed to Dar es Salaam Stock Exchange (DSE) at an IPO price of 275 where by it listed 67,827,897 shares. 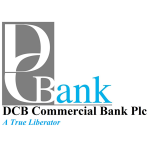 In February 2012, the Bank changed its name from Dar es Salaam Community Bank Plc to DCB Commercial Bank plc and in July 2012, the bank was issued with a license to carry out banking business country wide as a fully-fledged Commercial Bank.